A cloche hat with a cold. A wizard with a moon shaped electric guitar playing an epic solo hovering high above a mystical lake and lightning in the background. A picture of the imaginary friends that now grown children left behind all sitting or wandering around wondering what to do with their lives. Can I second Nathan's idea? This is one of the weirdest things I've ever seen. And I love it. Robodog meets The Vacuum in a dark alley. 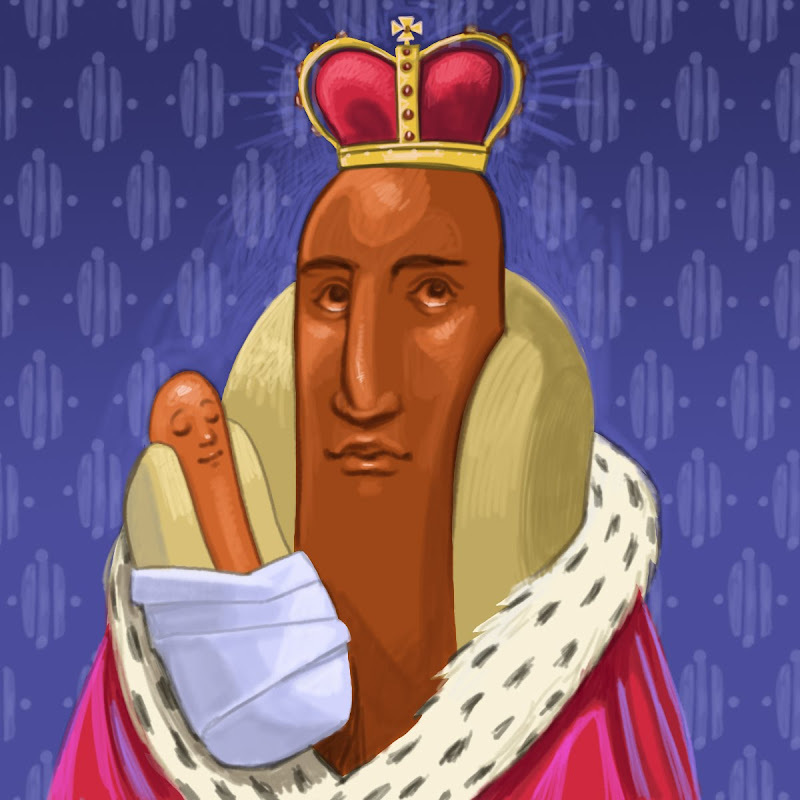 I would sooooo buy a book about a hotdog king and his baby! That is just adorable. Idea for the day? Egyptian dogs. Make the book about important hot dogs in the history of the world... like Ghengis Bun. There is a lot of potential. Ghengis Bun! (hilarious) I would pre-order that book. Daughter's idea: The Muppet's Swedish Chef riding a tricycle in the iron man. The Hot Dog king must live across the kingdom from the Burger King. And where does the Dairy Queen fit in? I sense a major motion picture and billions of dollars here! I think you should draw your ideal pet. How 'bout a gallery of wild cards--cards you would not want to meet in a dark alley--card sharks, card sharps, red cards, etc. This actually triggers another post idea--varieties of sharks!--Carpet sharks, nurse sharks, card sharks, etc. I can just see your classic "carpet is hot lava" game complicated by the introduction of carpet sharks. An elephant made of water, standing in water, shooting water out of it's trunk. A Leprechaun chasing after his pot of gold. a cassette tape, floppy disc, and vhs battling an Ipod, dvd, and laptop. Princely Purple Pickles with Parasols Parading Ponderously toward Paradise. Tessa: The president of the united states and some of his guards went on a roller coaster on the loop de loop.